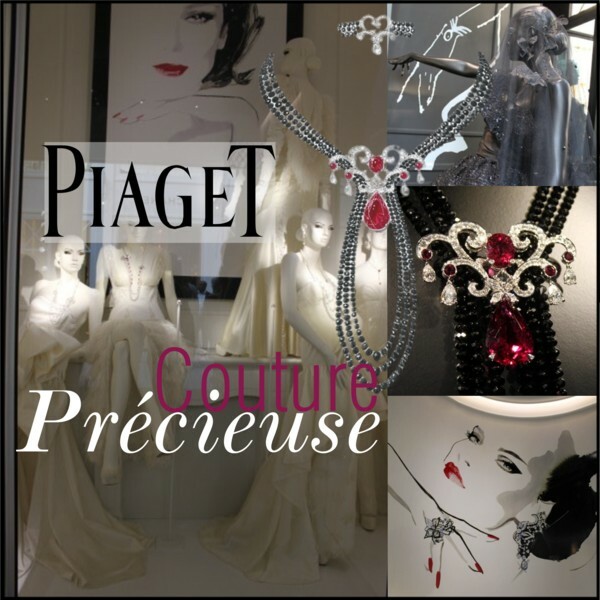 For its second participation in the Biennale des Antiquaires in Paris, the House of Piaget completely developed and crafted in-house, the new Couture Précieuse collection that pays homage to feminine beauty. 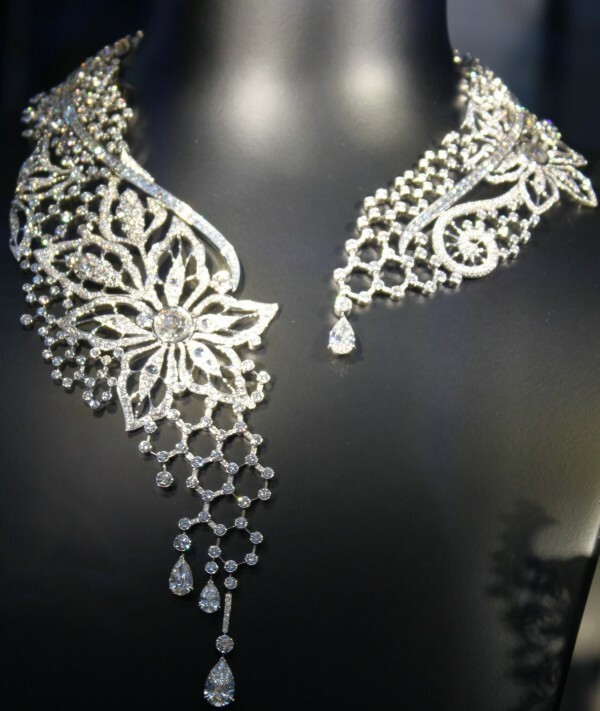 It was such a pleasure, a true feast for the eyes, to see those magnificent high jewelry creations. I absolutely loved the decor of the booth. David Downton, famous fashion illustrator and confidant of the world of Haute Couture, created eight sketches immortalising some of the models presented by Piaget. His work that is involving the use of gouache, acrylic paint and Indian ink, created splendid showcases for the jewelry sets. 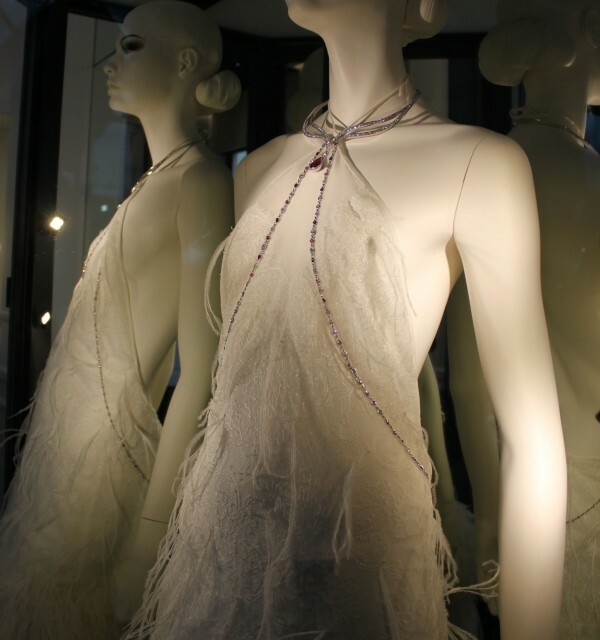 The jewelry sets borrow from the field of corsets and ribbons and celebrate the beauty of feminine curves. Piaget dresses the skin with diamonds, as light and vaporous as a breath of air. Like sumptuous lace or stunning guipure dresses, the creations reveal the smoothness of a glimpse of skin beneath golden fabric and stones. In these elegant and refined models, Piaget draws its inspiration from men’s dress suits, with the precious “brandebourg” motifs. 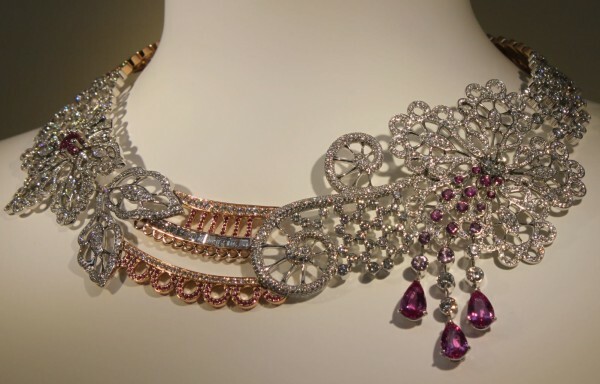 The quintessence of seduction is embodied in a sumptuous necklace embroidered with gold filaments and diamonds. Its entirely openwork, articulated structure makes it look like lace. This centrepiece of the collection is made in the same way as a Haute Couture dress, on the bias and finished with a smooth cut. It took more than 800 hours of work to create. White gold with 1513 brilliant-cut diamonds (44.19 ct), 133 baguette-cut diamonds (16.77 ct), 11 rose-cut diamonds (5.96 ct) and 4 pear-shaped diamonds (7.55 ct). And the absolute star of the show is the necklace inspired by a traditional fan which merely hints at what its wearer wishes to reveal. The contrast between a delicate central rubellite motif and the finely fashioned net motif on the fan creates a transparent play on light and shade. Each of the fan sections was separately crafted being assembled, and which looks as if it is ready to open and close with the next passing breeze. White gold with 728 brilliant-cut diamonds (47.13 ct), 5 pear-shaped rubellites (10.95 ct) and 1 cushion-cut rubellite (20.95 ct). A re-edition of a vintage 1970s model, the cuff-watch is inspired by knit dresses. 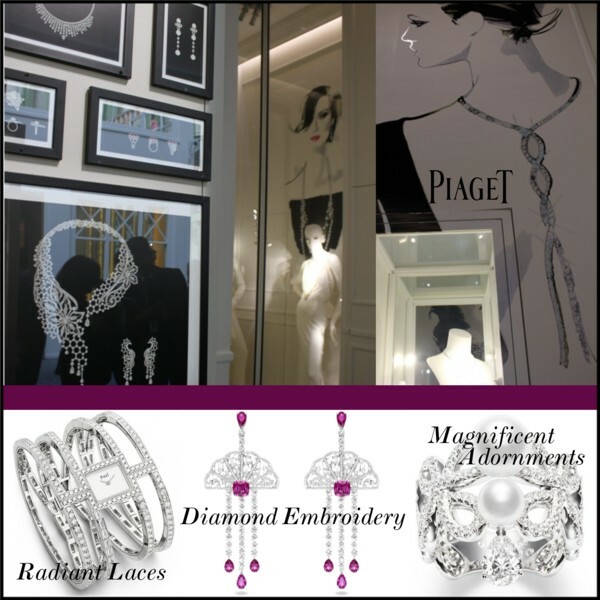 Its bracelet highlights the historical expertise of the chainmaker-jewelers of the House of Piaget. Gold is hand twisted, knit and formed into a mesh entirely by hand, much like the work of a fashion couturier. 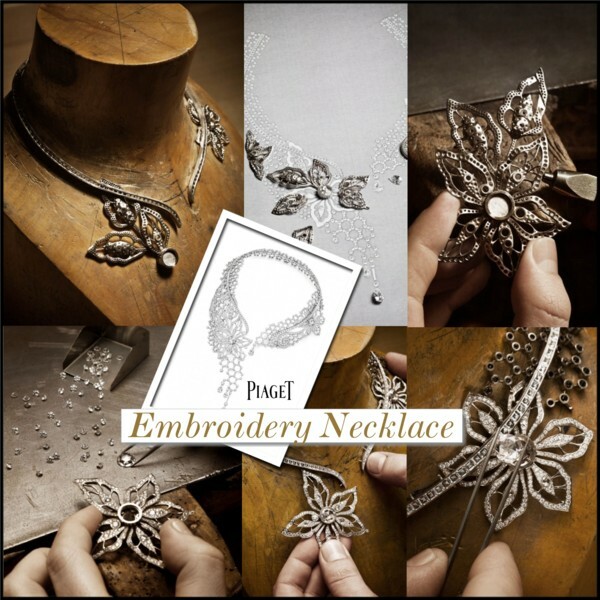 This provides an opportunity to emphasise the know-how of the Piaget artisans who, after patiently fitting each gold link on very tiny pins, give rise to these wonderfully supple and unique gold fabrics. It is a real nod to Piaget’s of the 1970s. Personally speaking, my three favourite pieces are the ones below. I have especially fallen for the Lace Mystery Necklace. Its shape enhances the feminine curves of the body and draws all eyes to its dazzling brilliance. 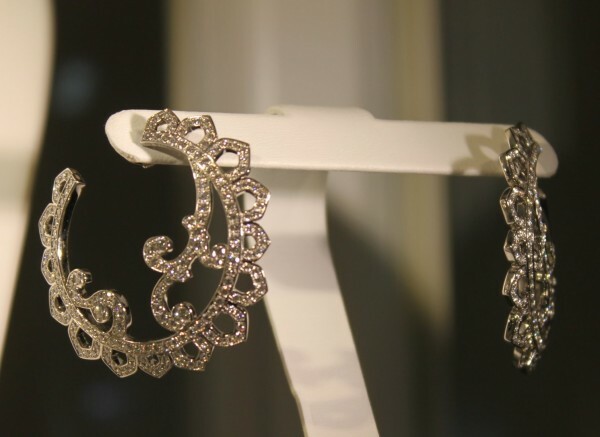 It is such a sensual piece of jewelry that could transform every evening gown in seconds to show-stopping appearance. White gold, 303 brilliant-cut diamonds (24.43 ct), 1 pear-shaped diamond (0.53 ct), 30 pear-shaped rubellites (7.34 ct), 29 round rubellites (6.03 ct), 50 round pink sapphires (4.17 ct) and 1 pear-shaped rubellite (10.61 ct). 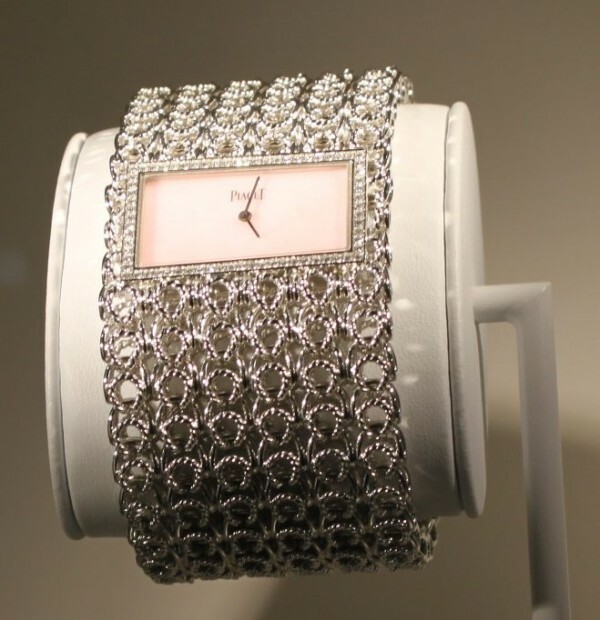 White gold with 378 brilliant-cut diamonds (4.44 ct). White and pink gold with 2395 brilliant-cut diamonds (24.54 ct), 10 square-cut diamonds (2.03 ct), 5 marquise-cut diamonds (2.21 ct), 1 triangle-cut diamond (0.09 ct), 1 pear-shaped diamond (1.50 ct), 1 cabochon pink sapphire (0.86 ct), 146 round pink sapphires (14.21 ct) and 3 pear-shaped pink sapphires (8.19 ct). Seeing all the craftsmanship that has gone into those outstanding creations, it makes you appreciate the work even more. Stay tuned for more beautiful pictures from the Biennale des Antiquaires 2012.